Hidden within the Delta Hotel (adjacent to the Grand Villa Casinos) in Burnaby, there once was a restaurant called EBO. 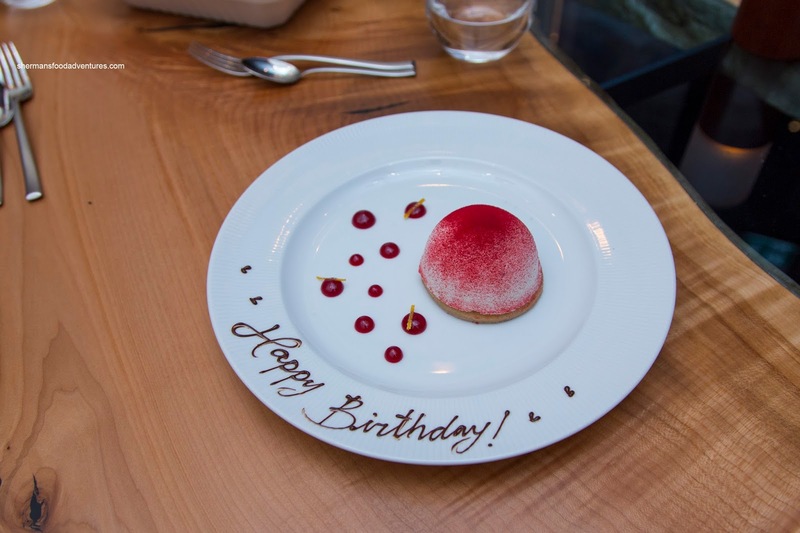 Often confused with being a Japanese restaurant, EBO stood for East of Boundary or later one, Experiences Beyond Ordinary. Whatever the case, this little gem produced great food in a classy environment. 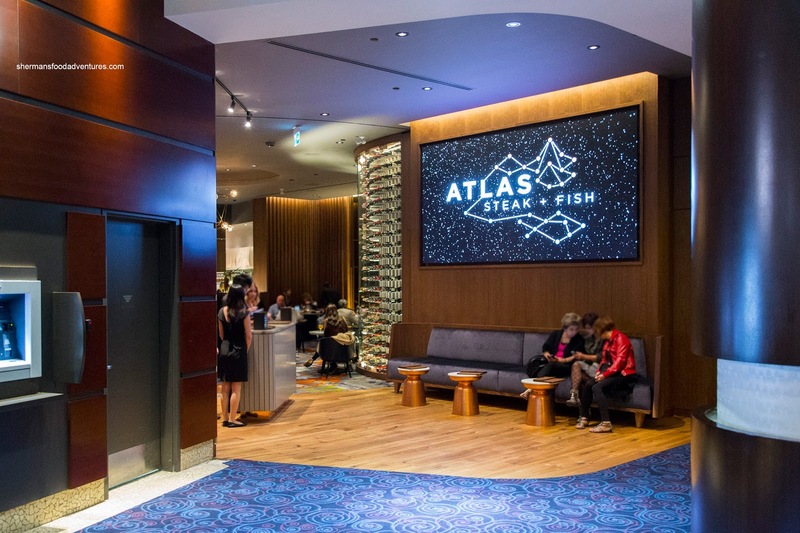 Alas, after the purchase of the Starwood Hotel Group by Marriott, EBO was closed and now Atlas Steak + Fish has opened up shop. We decided to check it out for my dad's birthday since EBO was one of his favourites as well. I must say they did a good job revamping the place as it is now modern and dare I say glitzy? We started off with their Seafood Tower for 2 that included clams, honey mussels, tiger prawns, king crab legs, Fanny Bay oysters and a lobster tail. Accompaniments included tobasco sauce, classic mignonette and half lemons. 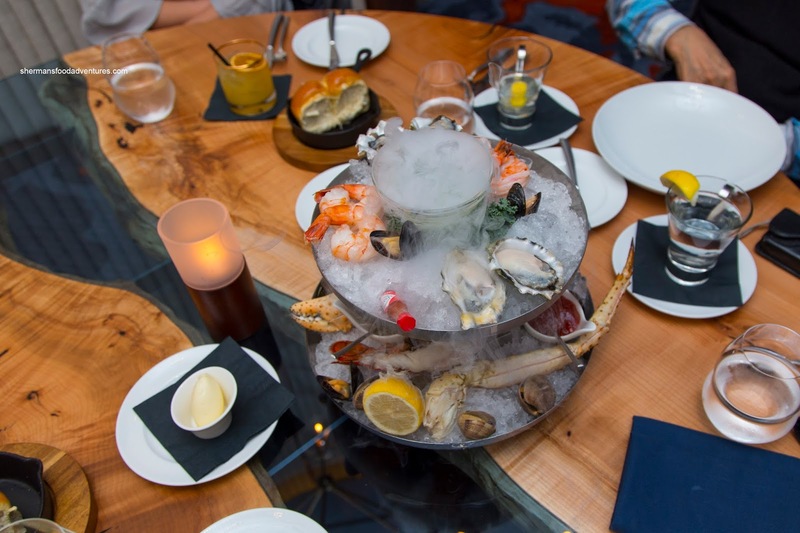 For $42.00pp, we thought this was a fair price considering the amount and types of seafood served. Furthermore, all of it was prepared correctly where the lobster was springy while not chewy while the mussels and clams were buttery with a slight chew. We thought the oysters were on point being sweet and briny with no shell fragments. 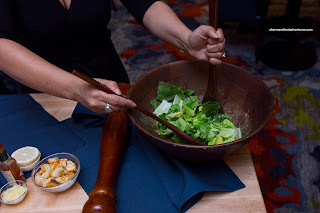 One of their signature appetizers is the Caesar Salad prepared fresh table side. We got a couple of orders for $13.00pp. Our server was attentive and wonderful where she also made a mean Caesar. Consisting of the classic ingredients including egg yolk, anchovies, minced garlic, lemon juice, Worcestershire, pepper, Parmegiano-Reggiano, Romaine and house croutons, there was also Tabasco which added a vinegary bite. Sure, the table side service was a gimmick, but a welcomed one as you could see what exactly went into the salad and of course it was fresh-tasting. With all things considered, it wasn't expensive as most jarred Caesar salads cost around $10.00 everywhere else. 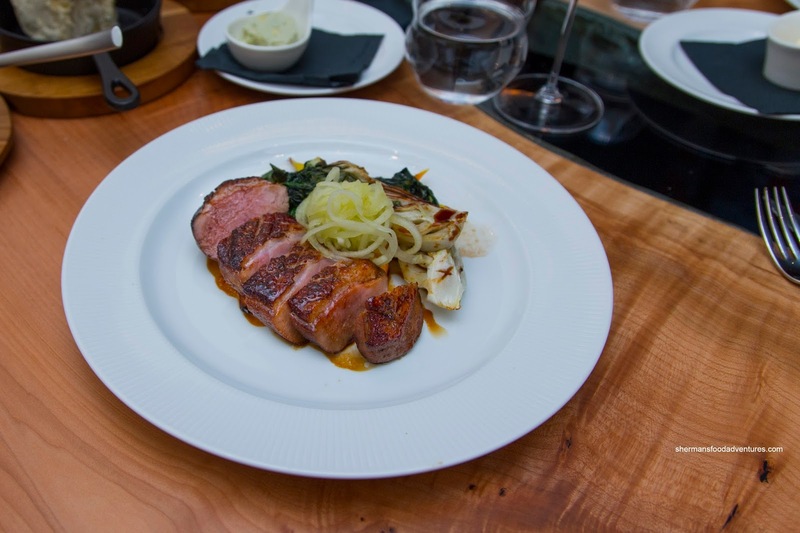 Onto our mains, I went for the Brome Lake Duck Breast prepared medium. As evidenced in the picture, the duck was executed properly with decently rendered skin. I would've liked it more crispy, but it wasn't overly fatty either. The duck itself was tender and fairly moist with some dry edges. The five spice was a natural compliment and wasn't overwhelming. On the side, there was pan-roasted sweet potato and apple slaw. 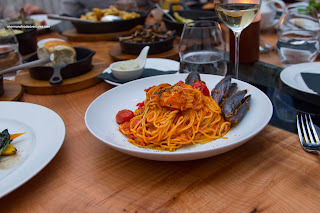 Viv decided on the Spicy Lobster Spaghettini with roasted tomato, fresno chilies and salt spring mussels. We found the pasta a touch soft, yet still good. The sauce was nicely tart, flavour and full-of-depth. It wasn't very spicy though and could've used more seafoodiness. The small piece of lobster was perfectly prepared as well as the mussels. My son is a meat and potatoes kinda guy, so it wasn't surprising he had the 10oz New York USDA Prime Striploin. 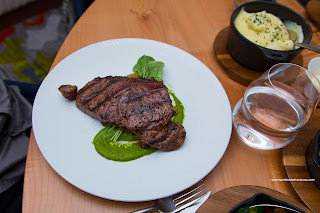 It was prepared a perfect medium-rare where it was juicy and flavourful. There was a crusty and peppery char on the outside which created a nice smokiness and slight crispiness. The meat did live up to its billing as it required very little effort to chew while still being meaty at the same time. 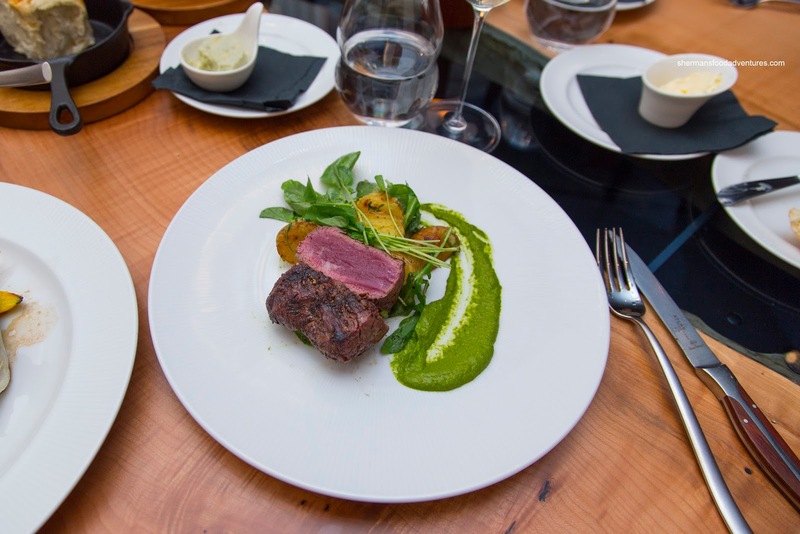 Following the same theme, my mom selected the 6oz Alberta Angus Reserve Beef Tenderloin prepared rare. She asked for medium-rare, but in reality, it didn't matter as the meat quality was so high, it ate super tender. As with the striploin, the exterior char was good. She added a side of red wine demi-glace that was silky, rich and deeply flavourful. As usual, my dad had fish in the Josper Grilled Salmon Steak. Unfortunately, this was probably the first dud we had for the meal. It was overdone where the salmon was a bit dry and lacking any flakiness. It did taste okay though as it wasn't overseasoned. Rather, the chimichurri added the necessary brightness. On the side, there was a warm potato salad. 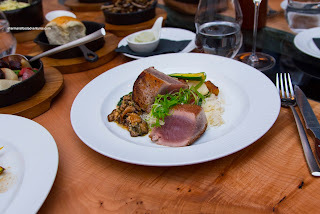 My daughter also had fish in the Seared Ahi Tuna & Shiitake Mushroom Vinagrette. The tuna was nicely rare in the middle, but the exterior could've been cooked a bit less. As for the vinaigrette, it was nearly inedible as it was super salty where the acidity couldn't even bring it down a notch. 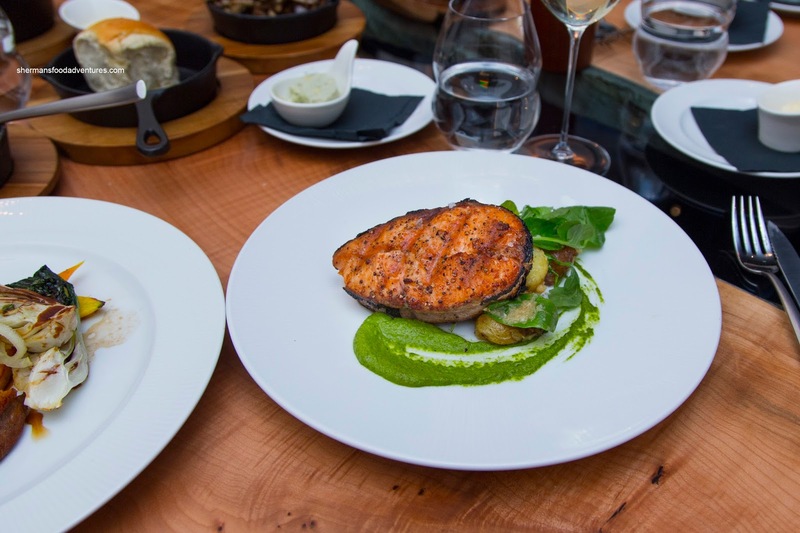 Suffice to say, the fish dishes were a bit disappointing compared to the previous dishes. As for dessert, we shared 3 including the complimentary Vanilla Cheesecake (Dad's birthday). Beautifully presented, the cheesecake was definitely cheesy while only mildly sweet. 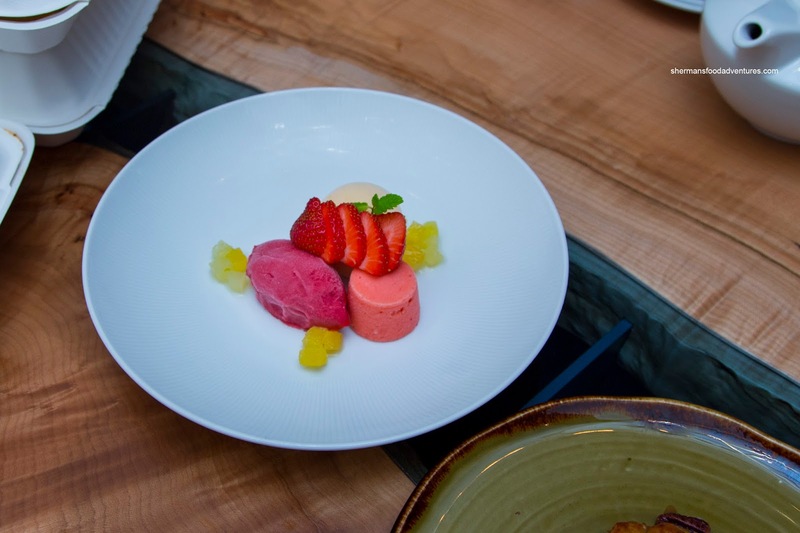 It had a hybrid texture of a panna cotta and cheesecake. Nothing wrong with that, but just different. Inside, dulce de leche was sweet and smoky providing the rich sugariness the the mild cheesecake needed. My daughter hijacked the Frozen Trio consisting of raspberry gelato, pomegranate lemon ice cream and tangerine sorbet. After sampling it, I could understand why as it was refreshing, impactful and nicely textured. The tangerine was my favourite was it tasted just like the fruit. 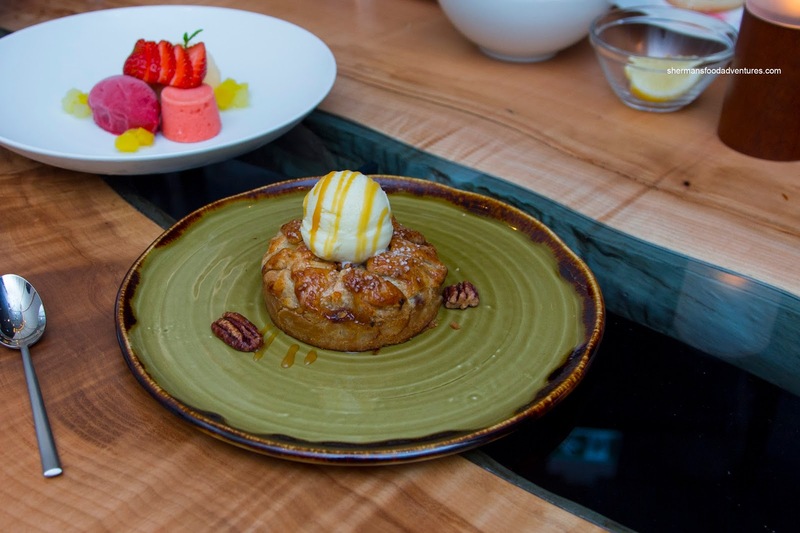 Lastly, we had the Apple Galette with rosemary ice cream, bourbon maple caramel sauce and candied pecans. Reminiscent of the one found at Joey (this is a compliment), the galette was flaky, buttery and full of tangy and sweet apples. This was not as heavy as it appeared and the flavours were balanced. Although the rosemary ice cream was aromatic and went well wit the galette, we found it too icy. Overall, our meal at Atlas was decent for a newly opened restaurant. However, with the price point involved, we would've liked to see more consistent execution. Maybe this will happen in time.